Earlier this month, Pinterest rolled out the ability to verify your website, which gives some extra authority to a business profile and may cut down on spam accounts. Verified websites appear in full on your profile with a red checkmark. Last week, Pinterest opted to follow in the steps of Facebook and created a separate tier of accounts for businesses. These are important steps that could make the network an even more useful social media tool for companies. We’ve covered some of the success stories on Pinterest already, such as Whole Foods and West Elm. Pinterest also has a number of case studies of its own regarding companies that have been able to build community and improve traffic on the platform. Here’s a look at the perks of this new type of Pinterest account and how to make a business profile for your company. There are some new features available to business accounts that can help develop a stronger connection between a Pinterest profile and a company website. Pinterest has added widgets that allow people to not only pin images, but also follow your pins and view your profile directly from your brand’s site. You can also embed up to 30 of the latest pins from one of your top boards to your site. In its blog post announcing the updates, Pinterest said that more features are forthcoming. 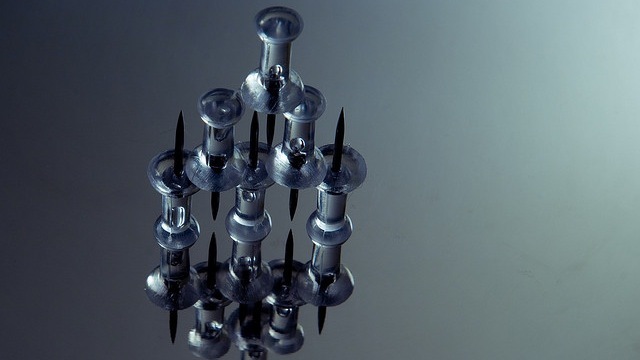 These tools will make it easier for a brand to draw connections between its proprietary online presence and its account on Pinterest. Just as companies that generate large amounts of written content can leverage Facebook to link sharing and conversations between their websites and their brand Pages, Pinterest’s new widgets help unify a company’s visual content. For brands that have already been successful in building a following on Pinterest, the features of a business page can strengthen those relationships. For those that have been hesitant to jump on the Pinterest bandwagon, the formal business option gives brands credibility that was lacking in the network’s early days. It also shows how serious Pinterest is about being a long-serving social media tool for both individuals and businesses — rather than simply the latest flash in the pan. If you decide you want to launch a new presence for your brand on Pinterest, there’s an option to create a new profile from the Business hub of the Pinterest website. Also, if you go to the main sign-up page for the network, there’s a line of text at the bottom asking, “Are you a business?” with a link to that section of the site. The first screen asks you to choose what type of business you operate. The choices are general categories, such as Brand, Retailer, Local Business, and Public Figure. You can change this field later if your business’ focus changes, or if you accidentally select the wrong option. You’ll also need to supply the name of the person managing your account, although that identity is not part of your publicly visible profile. Your visible data includes the name of your company and your website. You can also select the username that appears in the URL for your Pinterest page. A profile photo and brief bio description round out the profile. Once you agree to the Terms and Conditions, you can create the business profile. The process for converting a current profile to a business account is similar. From the Business hub, click the button that says “Convert your existing account.” You’ll be asked to log in, then the same screen will appear. 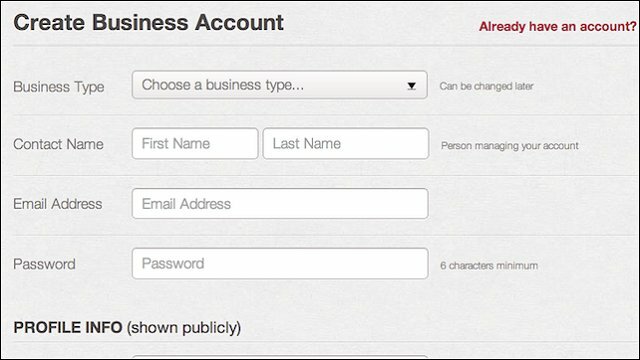 As with creating a new account, you’ll need to pick a business type and give the name of the person managing the profile. Some of your existing account’s information will automatically populate the appropriate fields for the Profile Info section, but you can update those details for a more accurate representation of your company. 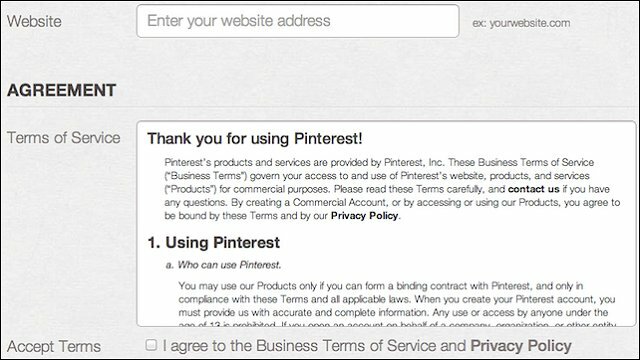 Be sure to read the terms carefully; Pinterest has created a new agreement specifically for businesses, so the language is different than when you initially created your account. 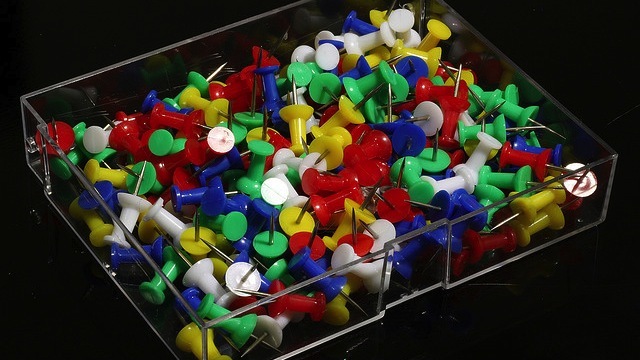 Is your business going to run a business account on Pinterest? Let us know in the comments!